Happy Monday! 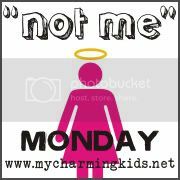 I am NOT sure what is going on at MckMama's tomorrow...be it Not Me Monday or Not my Child Monday but here's the deal. This week I have been the perfect mother. (If you believe that I have a bridge in Brooklyn to sell you.) And so I have NO NOT ME's to write about. (Do NOT forget that bridge.) My kids, however, have been up to lots of NO good things that NO child of mine should ever think of doing. So today at Art's Chili it will be NOT MY CHILD MONDAY. Be sure to stop over at My Charming Kids to see what everyone else has NOT been up to this week. When we were eating our lunch at our regular Sunday spot, California Tortilla, Elisabeth did NOT turn around in her highchair and spot some french fries that another customer had brought from Five Guys down the way. She did NOT then smile and wave at the ladies sitting at that table in hopes of getting a french fry. And when that did NOT work she most certainly did NOT start begging for french fries. And I am sure if you ever run into those two ladies they will definitely tell you that I did NOT look the other way and pretend NOT to notice that my one year old was acting like a street beggar instead of eating her perfectly good and favorite meal of black beans. My children do NOT love the Chronicles of Narnia. And they do NOT dress up in the really cool costumes they made and there is NO way they would play Narnia for hours on end. NOR did they make Elisabeth a bow and arrow. And in case you are wondering that is NOT a quiver on her back, either. And my NO good very bad kids did NOT make Samuel a costume so he could dress up like Eustace. And your eyes must be playing tricks on you because NEITHER is that woof-woof dressed up like Aslan. For the record my kids would NEVER dream of getting carried away, pulling out a ladder and climbing on top of the shed to get a good vantage point from which to defend Narnia from the Telmarines. NO responsible babysitter would put their six year old brother at risk for such peril. If they did by chance get such a notion, I am sure they would NOT take a picture of it for the whole world to see. One which could be used against me when safety frog or the grandparents, came to call. Oh, and I am the most safety conscious mother so I certainly would NOT laugh to myself and be glad that they are enjoying their child hood instead of lecturing them about what could happen. NOR was I secretly jealous because we NEVER thought up such cool games when I was a kid. I LOVE it...a mom letting her kids be a kid. I would be the mom freaking out about getting hurt(on the roof). Great NMM!! Oh My! I just love it! Your kids are so creative! How fun that they are ALL playing together in one activity. That is so wonderful! Sometimes my kids play school together. All of them from Josiah to Jacob. That is kinda of heartwarming for me. But, the creativity of Chronicles of Narnia and the costumes are just great. This was one of my favorite Not Me posts ever! Vivid imaginations they have! Elisabeth and her wanting the french fries from another table sounds like Andrew...and he flirts with every woman he sees. Can I come stay at your house because it looks like nothing but F-U-N!!!! Way cool! The costumes are great! p.s. I figured out how to do the hearts!!!! Wow! Those are some awesome Narnia costumes!! My 6 year old son would be so jealous. I love their creative play! I have been away from blogging for the weekend so sorry I am just now getting to thank you, but thank you so much for nominating me for the True Heart award. What an honor, blessing, compliment, and encouragement all in one! Hope your quiche from Friday found its way into the oven and was a super yummy blessing to your sweet family! What cool costumes! Great imaginative play! What great imaginations! I love how Buzz fits in with the Narnia crowd - he's a favorite in our house too. Oh how I want to show my 10 year old daughter just how incredibly imaginative your kids are, but then again I don't because I am afraid hubby would be asked to make or find a bow and arrows and just how cool is that, and why don't you let us do that? You know questions that right now, I don't have answers for. OK well I do, but the answer of, well why don't you just do it, I have never said No, you have never thought of something that cool, and if you did, can dad and I play too? Love this post and loving the adventurous spirit of your kids. Yours enjoy playing together I am dealing with teen versus 10 year old trying to get them to connect so that is where roller skating came in. Your kids are so creative! I wonder if that is from the girls? My oldest three being boys are only creative in thinking of ways to destroy things. And blow up and burn things. Not that they do it, they just spend a lot of time thinking and talking about it. My oldest girl is very imaginative and likes to think up plays and dances and uses her little sister as her sidekick. Only rarely can she get the big brothers to co-operate. I am sure the baby will be a willing participant before too long. I hope they continue because it is such fun. Kuddos to your kids and to you for letting them! We also LOVE Narnia! I had trouble trying to use the connect button. Blogger has been acting weird today or at least from my end. To miss Kat @ heart2heart, if you DON'T put in a request to my mom i can NOT send you an invite to my blog, kitti kat korner, where you can NOT learn how to make functionable, and safe, bow and arrows, that are certainly NOT fun to play with! Hahahahaha, this is so cool! I'm 16 years old and am definetly jealous of your children:) I wish I had awesome costumes to dress up in, and if only I could be creative enough to make a bow and arrow. Haha, I noticed that one of your youngest was wearing a buzz lightyear costume, or at least thats what it looked like. I wish I could have that kind of imagination again, I always had so much fun when I was little and now I see so much of that world in my younger sister. Oh my! we love Narnia! I enjoy visiting you blog so much!